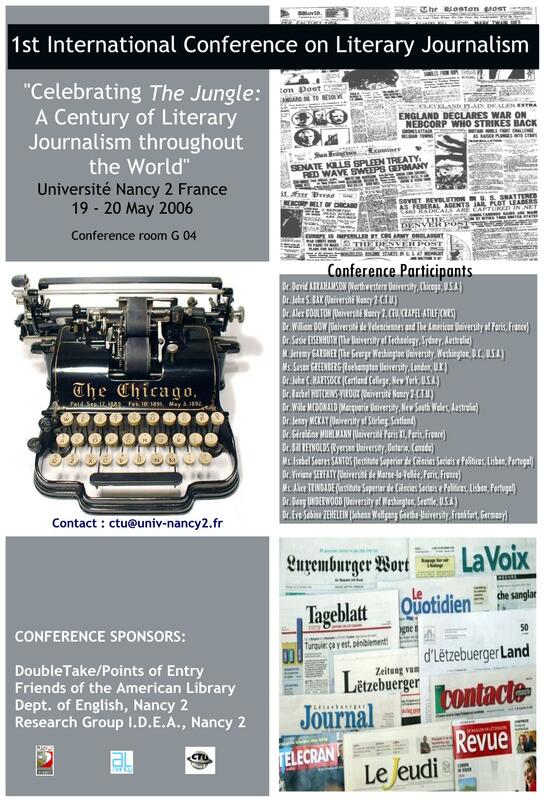 The First International Conference on Literary Journalism was held at Nancy University on the occasion of the one hundredth anniversary of Upton Sinclair’s muckracking novel The Jungle. Yet, while the commemoration of this anniversary was the specific occasion for the conference, the presentations were by no means limited to analyses of this single text. On the contrary, the call for papers invited scholars to reflect broadly on the genre of literary journalism, which The Jungle was so instrumental in establishing. It drew attention to a rich tradition of twentieth-century writing that followed in Sinclair’s footsteps: ‘from the sensational “yellow journalism” of Hearst and Pulitzer, to the “new journalism” of Capote, Wolfe, Mailer and Didion, to the “gonzo journalism” of Hunter S. Thompson, to the “literary journalism” of John McPhee, Edward Hoagland, Richard Rhodes, Tracy Kidder and Mark Singer, to the “blog journalism” of today, creative non-fiction writing has bridged the gap between literary and cultural studies, generating a new genre that is part fact, part fiction, but wholly artistic’. The conference brought together seventeen scholars, from seven countries and included twelve presentations and a concluding round table. The variety of subjects addressed over the two conference days and the range of interdisciplinary research methods brought to bear on this material made for lively and intellectually stimulating exchanges. However the success of the event is best measured by the scholarly activity that has grown out of it. Such was the satisfaction of those present with the avenues for interdisciplinary research opened during the conference that it was agreed to organize a second International Conference on Literary Journalism the following year. This event (also co-organised by John Bak) took place on May 18-19 at Sciences-Po, Paris and brought together more than twice as many participants as its predecessor. At the same time, it was agreed to found an International Association for Literary Journalism Studies, which has grown, in the years following the conference organised by IDEA, into a thriving scholarly organisation. Today, the IALJS has 120 members. It organizes annual international conferences which, following the Nancy and Paris events, have taken place in Lisbon, Chicago, London and Brussels. The IALJS publishes a biannual, peer-reviewed journal, Literary Journalism Studies. The impact that the Literary Journalism conference has had, internationally and across disciplinary boundaries, stands as a model for the type of scholarly exchange that IDEA seeks to promote by way of its interdisciplinary approach in English Studies. 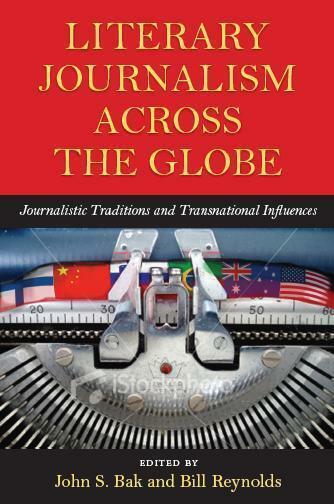 A collection of peer-review and revised articles based on the presentations given at the conference, Literary Journalism across the Globe: Journalistic Traditions and Transnational Influences, was published in 2011 with the University of Massachusetts Press.